Hunan Chinese Cusine, Natchez, Mississippi. Photo by Indigo Som. A year before Hurricane Katrina, I landed in New Orleans with my partner Donna Keiko Ozawa, a generous grant from Creative Work Fund and too much luggage — five cameras (still and video), sound equipment (including at least three microphones), a laptop for blogging en route, maps, guidebooks and organic snacks. 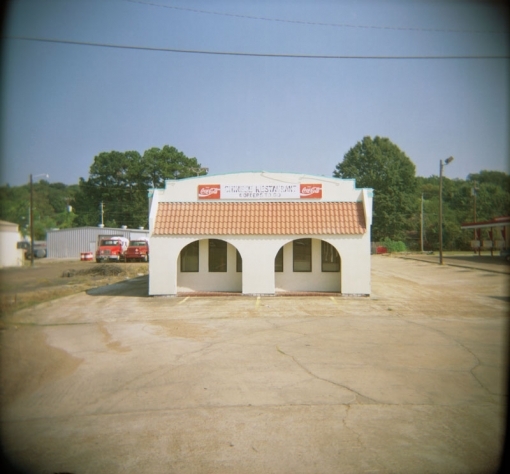 China Garden, Yazoo City, Mississippi. Photograph by Indigo Som. We spent three weeks driving through Louisiana, Mississippi and Alabama, looping back to New Orleans. Our mission: to explore the role of Chinese restaurants in the Southern landscape, foodscape and mindscape, mostly by taking pictures. How Joy, Greenville, Mississippi. Photograph by Indigo Som. 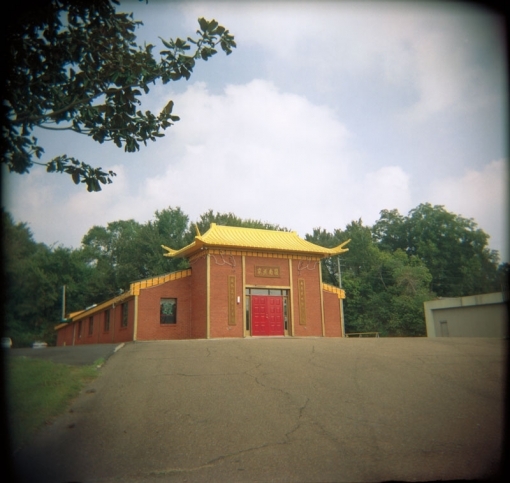 I did not have the slightest photographic leaning before I started working on the Chinese Restaurant Project in 2002. I was so photographically impaired that huge swaths of my life are completely undocumented, and even my grudging documentation of my artwork was always shot by hired guns. 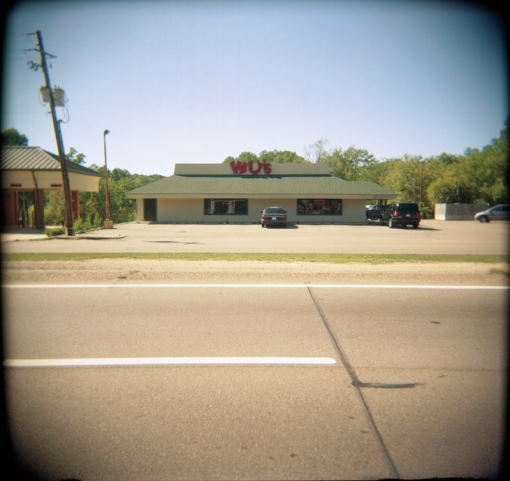 But when it came to this project, the images of the restaurants themselves were what haunted me the most. Prescient colleagues paired me with the all-plastic, no-tech $25 Holga, and I was on my way — first to Wyoming, then to Wisconsin — relying heavily on beginner’s luck. Wu’s, Hattiesburg, Mississippi. Photograph by Indigo Som. Then someone told me to look at Stephen Shore’s photography. Of course, in my photographic ignorance, I’d never heard of him. I got my hands on his newly reissued book Uncommon Places (originally published in 1982) just a couple of weeks before our trip to the South. Instantly smitten, I devoured it in between packing, revising the itinerary around that season’s hurricanes and painstakingly compiling lists of Chinese restaurants. To look at his work was to see hard evidence of something I had been intuiting and guessing at in my previous trips; here was the artistic lineage I could consciously aspire to. 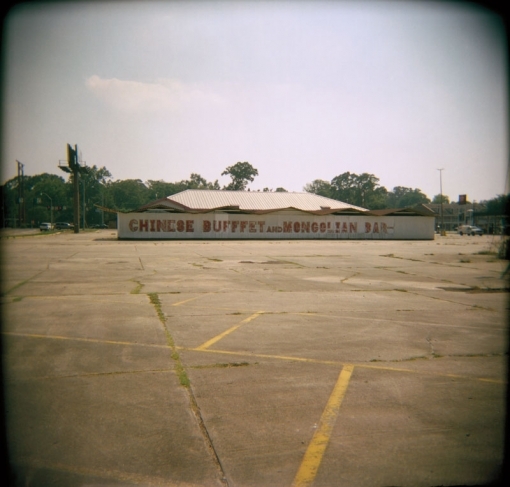 Mandarin Seafood & Monogolian BBQ, Baton Rouge, Louisiana. Photograph by Indigo Som. I was a kid growing up in 95 percent white Marin County, CA, when Shore and his contemporaries (including William Eggleston — whose work I didn’t look at until after the Southern trip, and then I looked at it quite a lot) broke a totally different kind of color barrier by expanding the art world conversation beyond black-and-white film. My formative years in 1970s America are exquisitely mirrored in Shore’s work. There is something spare and lonesome in the composition of his images that viscerally evokes my childhood experience of racial isolation — as do the Chinese restaurants I encountered away from my comfort zone of coastal urban Asian American communities. I feel an intimate familiarity when I look at his pictures. I didn’t need to know his name to absorb his aesthetic influence upon the visual culture of my childhood. South China, Natchez, Mississippi Hunan Chinese. Photograph by Indigo Som. 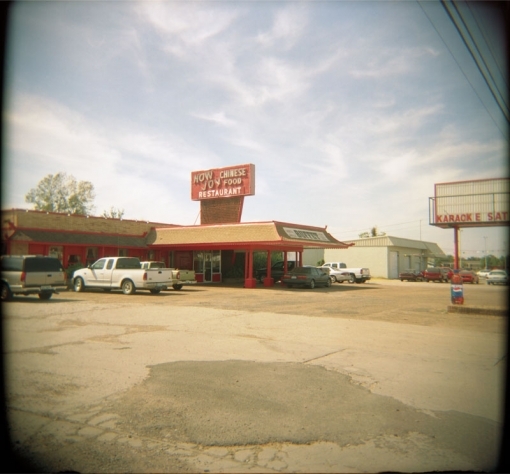 Part of what I hoped I could do with these photos was to reinsert the missing Chinese restaurants into Shore’s America and Eggleston’s South, because I know they were there the whole time.